1. Write regularly-The novel just doesn’t want to be done… that’s all there is to say. The characters just aren’t cooperating. Yeah, let’s blame them. I did make major progress though so I can’t say I failed. I’ve been better about blogging. 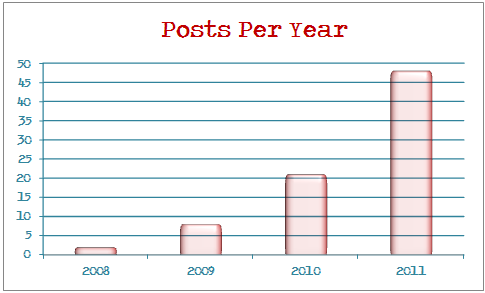 48 posts in 2011 doesn’t seem all that impressive but when you check out the percentage increase in my nifty little chart here, you’ll see I’ve exceeded the rate of 2010 by 128%. Not. Too. Shabby. 2. Read-I didn’t exactly knock this one out of the ballpark but since I copped out when creating the 2011 list and didn’t establish any sort of quantitative threshold for success, I get to call this goal accomplished. 3. Invite friends over-Again, no specifics outlined so I get to cross this sucker off the list. In January I hosted the 1st Annual Fake Thanksgiving… I even cooked my first Turkey. In October I had my housewarming party! I’m going to lump in the “ask for help” goal with this list too since I asked people to come over to help me move in June and also to help me/keep me company after my surgery in August. Being stuck at home for weeks inspired Waffles-n-Church where I invited folks over for breakfast and live streaming church on Sunday mornings. In preparation for my one and only craft fair of the year, there was also a Waffles-n-Crafts day. When I tell myself I didn’t accomplish much this year, a loud and excited voice in my head screams back, “YOU BOUGHT A HOUSE!!!!! !” If you told me on January 1st, 2011 that I’d befinishing the year out on MY couch, in MY house, watching fireworks over MY backyard I would have said you were crazy. GOD IS GOOD. Is it my 30’s kicking in? I don’t know, but I spent a lot of 2011 wrestling with the question, “What do YOU really want?” With the help of my awesome mentor, Lisa, I’m starting to understand my uniqueness and how it interacts with other personalities. I’m getting a grasp on the ways in which I am best filled spiritually and I’m starting off 2012 with a nice collection of “aha!” moments and whole lot of motivation to get some more! This year I did something I’ve never done. I handed over my writing for critique. TWO PEOPLE. This is big… maybe you have to be a writer to get this but goodness. It felt like asking a psycho killer to watch your baby. Then something amazing happened. My two friends, who are absolutely NOT psycho killers, handed me back a ton of encouragement, some questions and a few criticisms that grew my story and my writing in ways it never would have if I’d kept the manuscript locked up in its Microsoft Word prison. Lastly, in the most literal interpretation of this goal, I’ve adopted a new motto, “Do something for yourself today that your future self will thank you for.” Get gas tonight, give rushing-to-work-tomorrow-morning-Mariah a break. Make the bed now, it will give exhausted-going-to-bed-Mariah a smile. Overall, 2011 was awesome. Check and Check! Watch out 2012, I’m coming at you full speed!